The Google Play Store has been swarmed with various English proficiency app over the years of its development. English is really a difficult language to learn especially when you're not a native speaker. And since the development of Android and other mobile operating system, the diversity of learning new language is just a piece of cake. The introduction of Learn English 6000 Words app in the Play Store has kept adults and children busy with their "vocabulary fix." Unlike any other vocabulary app, the Learn English 6000 Words is fun. It's game-like features will get you hooked right on the spot. The app will basically give you instant entertainment with its 7 enjoyable games. The vocabulary theme is divided into 15 topics with 140 sub-topics. And you can choose your level of difficulty in each game stage - beginner, intermediate and advanced.The app also supports varied base languages for leaning English - German, Arabic, Chinese, Turkish, French, Spanish, Italian, Romanian, Portuguese, Russian and of course, English. The developers from Fun Easy Learn made the app free for everyone in the Android ecosystem so it'll never be a hassle for users who're having a tight budget for vocabulary apps. And one good thing about this app is that it doesn't need an internet connection to keep things working. The interface of the app is very user friendly. For a first time user, I find the app so easy to manage. It'll also help a lot of users to understand and remember the words faster with its nice graphics and pictures. The multimedia features (audio-visual) is also one of the selling-points of this app. Plus, the the native built-in "Spin Categories" will give you random set-up (game, subtopic, etc.). 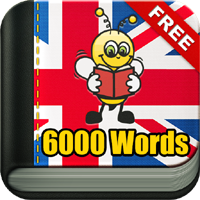 The Learn English 6000 Words is a great app for those downtimes in the bus or train stations. It doesn't need any data connection and it's definitely an enjoyable learning for everyone.